this movie had what the sequels missed out on, smokey. he pretty much made the first movie. such memorable lines in this movie at such quantities, it's hard not to like it. "how do you get fired on your day off?" "what you stealin boxes for, you tryin to build a clubhouse?" i have seen this movie at least 100 times and still never grow tired of it. whenever i can't think of anything else to watch, friday creeps up and inserts itself into the dvd player. great great movie. of course deebo was a great villian. there is allways that big @ss thug that wants to prove that noone can step up to him. what a better person to play that role then tom 'tiny' lister jr. maybe that guy from the green mile. chris tucker was absolutely amazing as a pothead. i don't think anyone could have pulled that role off better then him. ice cube did a great job as craig and i don't know who played as mrs. parker, but she did a good job too. then you have the corrupt preacher played by bernie mac. hillarious movie from beginning to end especially when they did the flashback scenes with smokey taking a hit of angel dust and finding himself in deebos chicken coop. this movie had one of the best soundtracks ever put together. everything from ice cube and cypress hill to rick james and 2 live crew. best placement in the movie for the soundtrack had to be when craigs girlfriend got out of the car all pissed off and hoochie mamma was playing in the background. the best hood classic ever. One of the best comedy films ever! True classic! This movie is one of the funniest movies I've ever seen, me and my family still take lines from it. For those who watched it when they were younger and still have time to enjoy it I would definitely recommend this movie. It's a must have. Funny, Funny, Funny~ This is a must have for any collection. Like to laugh? 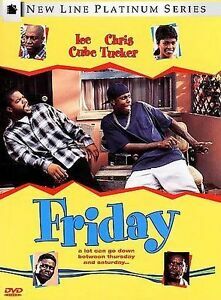 Then this is it..Ice cube in one of his finest roles. Chris Tucker is as crazy as ever. Debo (Zues) is crazy and always goes for bad, but in the end ice cube actually wins the fight. This is hilarious and has some other great named actors and actresses in this as well. You sont be sorry if you get this one. I promise. Smokey, you been smokin' my shi+ ? I stink I'm thoned. Folks, this is the best ghetto weed movie to ever come out. It is simply hilarious with true talents throughout the film. Everyone in the movie was PERFECT for there part. Ice Cube, Chris Tucker, John Witherspoon, Tiny Lister, Bernie Mac, Ann Maria & Nia Long make this movie the best weeedhead movie since Cheech & Chong. The "comedic ghetto stylings" of these characters will have you ROLLIN'!!! Rollin' in more ways than one if you catch my drift. This movie is DA BOMB! It delivers A TON of laughs with sarcasm and witt. ALL of these characters deliver the punch that you were looking for in your funnybone. I own the DVD and have watched it countless times and gotten value from it EVERY SINGLE TIME! I have it in my keepers section. So come on over and watch it with me. Roll it up my homeboy. Roll it up. I'm talking about laughter here folks! Get your weedhead out of the gutter. Okay, so I WAS talking about the other. Enjoy. Please see my other reviews for more "pee in your pants funny" movies. If you see this movie one time, you will be hooked. Even though its set in south central LA, the pace, content and tone of the movie will have you in tears from laughter and side splitting guffaws. If you have never seen anything that Chris Tucker has done, this would be the one. Ice Cube excels as a director and main character and I strongly advise you to watch his other comedy-drama Players Club...awesome...hood comedy at it's finest.